Birds are social creatures and can be very active during the day. Exercise is important in keeping your bird healthy and happy. The size of your bird will determine cage size. Birds should have cages large enough to fully extend their wings and flap them. If your bird is caged all the time, allow space large enough for at least 3 wingspans. Small birds like to flit from perch to perch. Larger birds like parrots, love to climb. Ladders and perches placed strategically allow your bird to exercise a favorite sport. 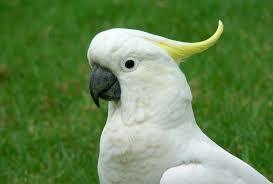 You can purchase natural perches that help keep your bird’s beak trimmed when s/he nibbles on them. Prove a cuttlebone too as it supplies calcium. Toys keep a bird active and prevent boredom which can lead to feather plucking. Toys made of plastic are not advisable especially for large birds as the chewed pieces can injure them. When purchasing toys, keep in mind the size of your bird and cage size – you want to have enough room for your bird to stretch his wings. There is a wide variety of toys to choose from, the safest being made of wood, leather, rawhide. Birds love to look at themselves and mirrors make very interesting toys. Those made of stainless steel seem to last forever. Toys that make noise such as bells are very attractive to most birds. 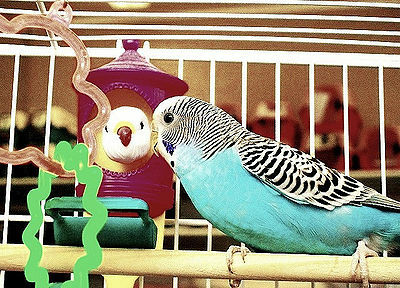 For play outside the cage, there are different styles of bird gyms creating enjoyment for your bird. Included in the gyms are perches, swings, mirrors, food and water dishes and a bird bath, all keeping your bird busy and interested. If you wish you can add your own toys to the gym. Besides keeping your bird healthy and happy, watching your bird exercise and play will keep you smiling too.